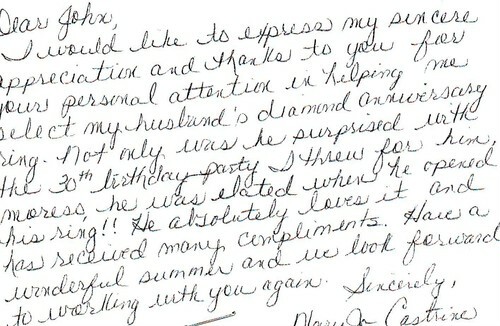 "I would like to express my sincere appreciation and thanks to you"
I would like to express my sincere appreciation and thanks to you for your personal attention in helping me select my husbandâ€™s diamond anniversary ring. Not only was he surprised with the 30th birthday party I threw for him, he was elated when he opened his ring! He absolutely loves it and has received many compliments. Have a wonderful summer and we look forward to working with you again.